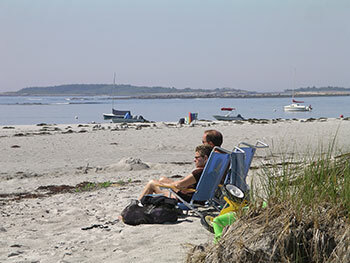 Goose Rocks Beach – Kennebunkport’s Largest and most scenic beach. Maybe Maine’s most scenic beach! First of all, Goose Rock Beach is very sandy – despite how it sounds. This seaside community is part of Kennebunkport – but off the beaten path of the Bush Compound and bustling Dock Square. Traveling East from Kennebunk and Kennebunkport, past Cape Porpoise, you arrive at Goose Rocks – a classic strip of summer cottages, a few seafood restaurants, a general store, an ice cream stand, two resorts and a big beautiful beach as the focal point. 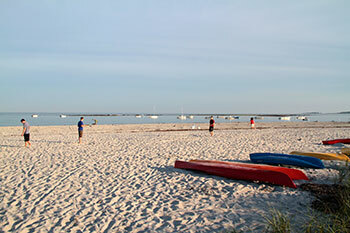 Goose Rocks Beach extends for three-miles of soft sand. It is perfectly protected in a seaside crescent beach shape, so the surf is gentle and the sun is warm in summer months. Views of the Ocean, and outlying Timber Island and Timber Point offer pretty scenery. The beach is actually named for Goose Rocks barrier reef that lies offshore, which is visible at extreme low tide, and provides a buffer to the sand and beach from the big waves off shore in the Atlantic. To the North of Goose Rocks Beach is Granite Point and Biddeford Pool. Goose Rocks Beach Parking is at a premium along Goose Rocks Beach, and beach parking permits are required – you can purchase them at the Kennebunkport Police Department, and the Goose Rocks General Store. Visitors should be aware there is an on-going controversy over Goose Rocks Beach access between visitors and beach house property owners, so be respectful and tidy when accessing the beach, and stay off the dune grass. Goose Rocks Beach does not have lifeguards or beach services. While most of the seaside cottages and beach houses on Goose Rocks haven’t changed over the years, many Maine families rent their summer homes by the week and the month here at Goose Rocks. There are a few hotels and resorts in Goose Rocks Beach, Tides Inn by the Sea is located right by the beach, offering beach view dining and a chic bar with fun happy hours on Sunday afternoons in summer. Not on the beach, but nearby in Goose Rocks are Ocean Woods Resort and Hidden Pond Resort – both offer lodging, dining and wedding facilities. During your vacation in Kennebunkport, be sure to venture out Route 9 from Kennebunkport and Cape Porpoise to Kings Highway and walk along Goose Rocks Beach – it’s a beautiful stretch of sand you have to “sea” to believe.